When Odin of Midgard, Thor’s father, is, supposedly, murdered by Malekith’s forces, the Ten Realms are drawn into a war which will determine the fate of all existence. After reading issue #1, this is my non-spoilery synopsis of Marvel’s latest mega event, War Of The Realms. 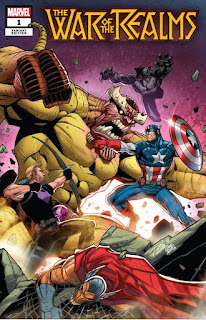 Like all mega events, since the original Secret Wars, the story consists of a main title, several tie-in titles, and relevant issues of ongoing titles. Make no mistake, I DO NOT plan to collect every single tie-in. Not only would it eat up way too much of my bank account, I learned long ago (in 1991 with DC’s Armageddon 2001 and War Of The Gods) that many tie-in issues don't add much to the over all story. As for me, I’m going to collect the main title, War Of The Realms: Punisher, War Of The Realms: Uncanny X-Men, War Of The Realms: Scrolls (because Captain America is in it), and the tie-in issues of the titles I normally collect. I recommend you do the same; find a few tie-in titles featuring heroes you really like, and don't knock yourself out trying to collect every single skirmish. To make these blogs easier to post on social media, I'm moving the Spotlight section back to the end of each entry. 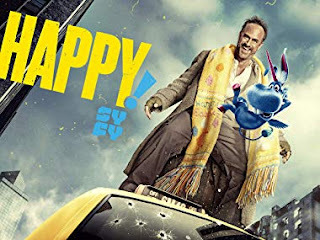 Happy!, arguably one of most bizarre shows on TV, has returned to SyFy for a second season. The show, based on the graphic novel of the same name, tells the story of, alcoholic ex-detective, Nick Sax being guided by his daughter's imaginary blue unicorn. The first season was about rescuing his daughter from a sadistic Santa. This season revolves around a sado-masochistic Easter Bunny and a plot to control the Easter holiday by scamming the Pope. Happy! is a show jam packed with graphic violence, adult language, and sexually suggestive content. While the show is crude, violent, and COMPLETELY INAPPROPRIATE FOR CHILDREN, adults will find a hilarious exciting series. Happy! airs Wednesday nights at 10pm on SyFy.